WLN Chicago was abuzz with excitement after an engaging keynote speaker event featuring Michele Thornton Ghee, Author, and SVP of Media Sales for BET HER. Just under 100 IPG women and men walked away with the tools and motivation to take the first step on a new “stratechic” journey, thanks to Michele’s empowering advice, inspiring anecdotes and relatable charm. 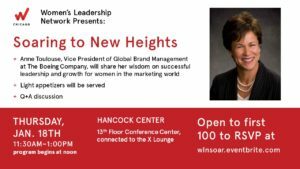 WLN Chicago kicked off 2018 in style with Soaring to New Heights: a speaker event featuring Anne Toulouse of The Boeing Company. Anne has been a fabulous partner to many at IPG, so attendees were excited to hear her wisdom around successful leadership and growth for women in the marketing world. Networking, Self-care, and Puppies – Oh my! 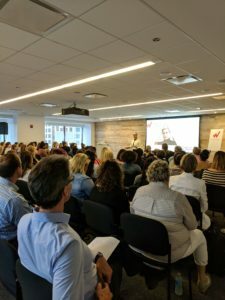 Self-care was in the air at WLN Chicago’s latest event. 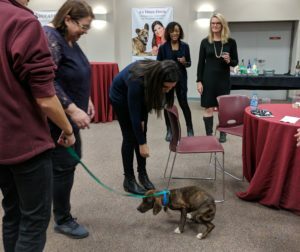 The chapter hosted a night of networking and guided discussion about self-care for women leaders, with an immersive pet therapy experience with shelter animals from The Anti-Cruelty Society. Attendees connected over their shared struggles and triumphs with balancing work and life, and took much-deserved time to relax with some furry friends. We have revived the Chicago Chapter! Time for some wine and cheese! Please join us for our Kickoff Event on May 10, 2017, at 4:00 p.m. The main purpose of our gathering is to have some time to meet each other and explore what we might like to do as the Chicago Chapter in 2017 and 2018. Did we mention there will be wine and cheese?